It’s been a while since we reviewed the Dymo LabelWriter 450 Twin Turbo, with its awesome ability to print labels without any ink. I would have to say that the Dymo Rhino 101 is probably its poor cousin. Of course, there really isn’t anything technical with the Rhino 101, really. It doesn’t have a keyboard, or anything to type out individual letters. In fact, it really is just a glorified roll of white tape. Because of this, my source really bad-mouthed this product, going so far to deem it unnecessary. I would agree that you could probably do the same thing with some white tape and a Sharpie, but the Rhino 101 gives you something that you need for that: a flat surface. That’s right, if you just had white tape and a Sharpie marker, than you would have to tear the tape, stick the tape, and hope that whatever you stuck it on would be flat enough for you to write on it. 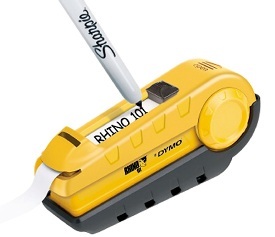 The Rhino 101 provides that flat surface, so you can just write what you want in the space provided, tear off, and stick it to anything, even carpet. Yeah, that flat surface might not be much, but hey, I think it makes a world of difference. Besides, the Dymo Rhino is only $20.00. Surely this convenience is affordable at that price. You must be ‘under the influence’; I agree with your ‘source’ completely !